I wanted to address a topic we get asked fairly frequently, and that is how you set out a website to rank in multiple towns and cities. 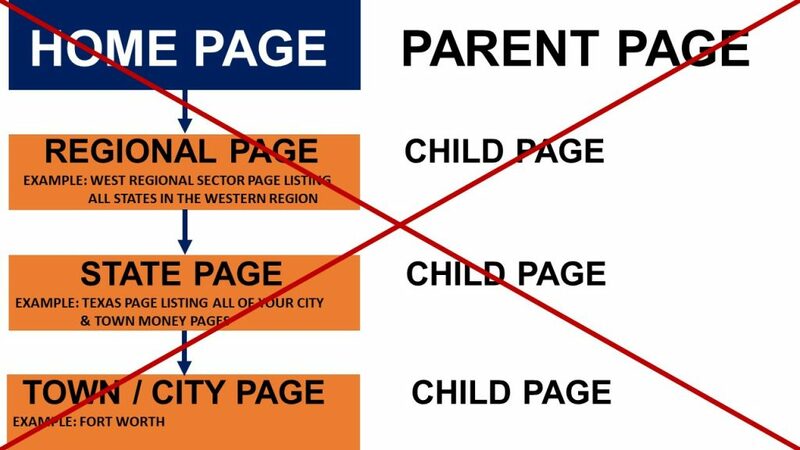 Most I see most people do is to build a town or city money page and duplicate that whilst changing any reference to the city in the first page for the name of another town or city. Then, carrying out the process multiple times to produce a website created in record time that is relevant for all towns and cities across the nation. Whilst this might sound like a good idea, it is actually one of the worst things you can do, and I will explain why. Basically, you do need to be careful that you don’t turn your site in to a doorway site. OK, what is a “doorway” site? Well, it is a site that has multiple pages that are created specifically to rank for a specific phrase or set of phrases. The pages usually consist of duplicate content and from Google’s perspective, these pages offer little to no value to anyone other than the webmaster, and Google hates doorway pages. You can read more about doorway pages from Google itself. As I said, Doorway or Gateway pages as they are also known, are against Googles quality guidelines, and if you are simply creating multiple pages that are only optimized to rank for different towns and or cities, then that could be seen by Google as doorway pages. The screenshot above is an example of a site that Google doesn’t particularly like because it is using doorway pages. 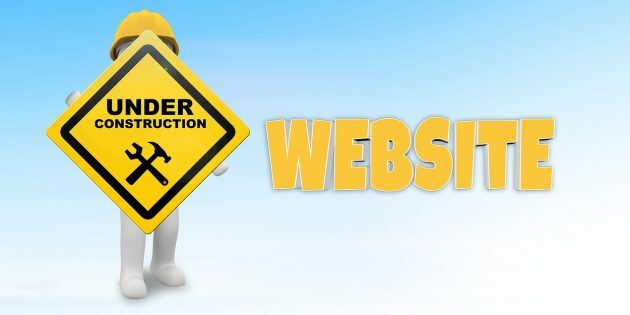 If you adopt doorway pages as a strategy to quickly build out your site and be relevant for numerous towns and neighborhoods, your site will most likely get a Panda penalty. Now that doesn’t mean you won’t be able to rank, it just means your quality score will be lower than a site that isn’t hit in the same way with a low-quality Panda score (all things being equal). Some sites that use doorway pages are ranking, but those sites tend to have massive authority and a natural looking backlink profile (mrrooter.com is an example of such a site). How Do You Set Up A Site For Multiple Towns & Cities Then? It’s OK to set up pages on a site for different cities, but they need to be completely unique and appear natural if you want to avoid damaging the Panda quality score on your site (all sites are assessed under the Panda algorithm and all sites receive a Panda quality score. Sites that violate the Panda algorithm receive a poor quality score which affects rank position). If you build a brand-new site based on doorway pages, then you are simply not going to rank that site in those cities. The best way in my mind to build a site that has a page for each town or city is to give that city page a reason why it should be on the site. If it is a page that offers no value to the site other than adding a different address for a particular city, then that is effectively a doorway page. 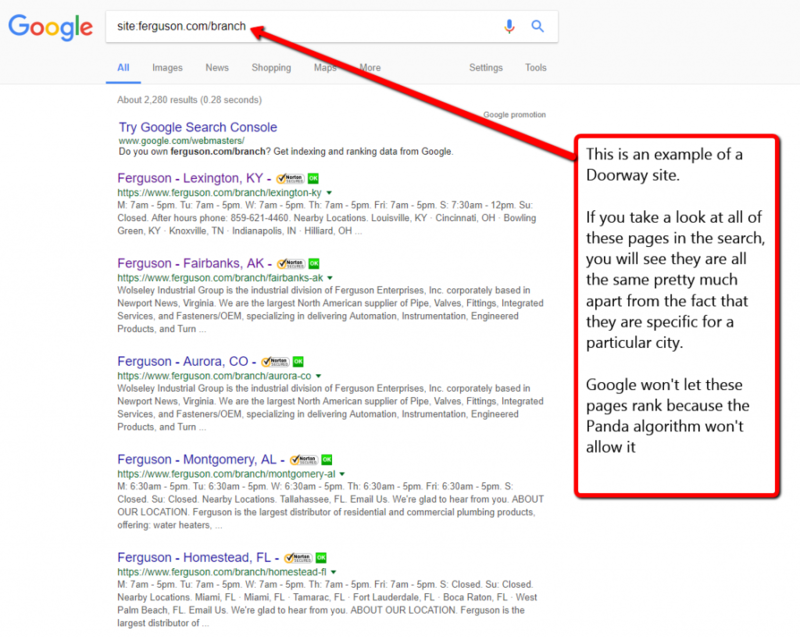 The other issue is that if you have multiple town pages, you will want them to rank, and we all know that if a phrase has any competition, that page is going to need some kind of SEO done so that backlink power can get that page to ranked in Google. The only way you can get that to happen is if you carry out individual SEO campaigns for each page and or you structure your site very effectively so that you pass on SEO link juice from 2 or 3 main pages of your site on which you carry out your main SEO campaigns. What you should do then is this. Let’s say you have a 5 city / town site, you could link from the home page directly to a page / post for each city / town. At the top of the fold for that town / city page you can have the contact details and your embedded Google map together with all the sales bullet points. Then under that, you can have an article about plumbing or plumbing tips (for a plumber site for example). You could also introduce your plumber from that town and write about him. Include testimonials about him from customers. Write any tips he might have. Make the page about him and how good he is for your company. Make it personal, and include local data, but don’t make it spammy. Do that, and you will have a much higher converting page because it will come across more interesting and real than a boring “We are the best” sales pitch which the visitor has seen dozens of times before. Also, by creating unique pages like that, you will become relevant for the town you want to ranking in and for the phrase you want to rank for, and you won’t have any Panda penalty issues to contend with. If you have a 100 city / town site, it is a little bit more complex, but still simple enough. Basically, you do the same. It will be a fair amount of work to get content for all of those pages, but it will be worth it. Don’t try and short cut essential steps, and the content is an essential part of the process, and quality is key. So these cities for example, would be listed on the Texas page and each would link to the money page for the specific town / city. You should make the 5 main US Regional sector pages and each of the state pages more than just inner link pages ideally. Add additional content that explains what the page is about. It should not be just filler content, but should be both informational and navigational for the visitor even though the main purpose of these linking pages is to pass on power and authority to the money pages (city pages). myplumbersite.com/Regional/State/City. So you don’t build it like this. So to recap, you simply create the 5 US Regional sector pages that lists and links to all the states pages and you create the states pages. Each of the state pages list and link to each of the towns and city pages. By setting up your inner links like this, you pass on the link juice from your main navigational pages. A powerful SEO campaign to your home page would pass on link juice to every city page in this structure. The towns that had low levels of competition may rank without doing any SEO to those specific pages, and your main pages, the larger towns and cities will have a major SEO boost because effectively, you will be carrying out an SEO campaign to those pages by SEOing the 3 main page types listed above. For your Main City Money Pages, you will need to carry out additional campaigns to rank those, but they too will have received a major boost by leveraging the link juice from the powerful inner linking structure of the site. I have laid out the steps for a smaller multiple city site and a huge major national site. Obviously, a huge major national site like I have detailed is a vast amount of work to build and rank, but I have shown you the fastest and most simple steps. If your site falls in between these, you can scale between it. You simply need to use your imagination. I have shown you the best way to set up and layout a local site that covers multiple towns and cities, so I wish you all the best with making it happen. I have only shown one region to simplify the diagram. The Region page is in effect an “orphan” page because it is not linked from the homepage. Am I right? No, that’s not correct Les. You link from the Home page to the 5 regional pages (or however many you want). Each regional page lists out all the states within that specific region. You you have 5 pages which when combined, list out all the states. OK, let’s say you clcik on one of the states on one of the regional pages (Texas for example). This will take you to the city page where you list out all the cities you are dealing with in Texas. When you click on the Dallas page for example, that will take you to the Dallas money page. On the Dallas money page, to complete the best paractice inner linking, you should link back to the home page. Like the value of content on this topic, quite succinct and relevent to what I am working on with site ranking for local businesses. I gather the recommended steps for Regional and state , city town in the U.S. would be how I proceed for regional and city areas in Australia. On another point to ask if you please is having Amazon hosting for local agency website which source is USA what does this do for SERP when pages are targeted for Australian businesses. Incidently, I did invest in a site ranking plugin to install for clients and if I use this plugin myself to market as a mobile website sales/ seo agency for local business, is it best to concentrate on a single locality or set up for regional keyword terms or does Google places overide all this? You are best to have a host server that isa based in your country, however, the ranking in SERPS is minimal and you will still definitely be able to rank on the Amazon server in Australia. What if you have a client who wants to rank for other cities/towns/areas? If the creating doorways is frowned upon how do you get them to rank beyond their primary city location (i.e. the area next door). Great article, Chris. I was thinking of creating a multi city/town site for [plumbers] in my state. If I want to build a site that has a page for each city/town that has value, and I want to have [plumbing] tips and other [plumbing] information, if I want to introduce a [plumber] from that city/town and include testimonials about him, do I have only that [plumber] listed for that city/town? What is the best way to solicit [plumbers] for each city/town? There are a number of different strategies Roy. Best to change thing and not have a plumber in each town give details. You just need to use your imagination. They can be pseudanyms for example, and at the bottom of the page you can put a disclaimer to say that the names are pseudonyms to maintain privacy for the staff (for example). The pages can show testimonials, tips, advice, stories. Each page can have one or more of these. The content doesn’t need to be thousands of words long, but each page needs to be different. Once the site is up and ranking on page 1 for a city/town, what is a good way to solicit [plumbers] to pay a monthly fee to be on the city/town page for their area? They are likey to say yes, and you can then follow up by saying that the conditions are that if they are happy with the free trial they can continue receiving the leads by renting the page and the page will be tailored to their company specifically. Sweeeet! One of the best articles, advice, and directions to get started and sustain an SEO effort that I have ever read! Golden nuggets… Much Thanks!